The myMix IEX-16L-A 16-Channel Input Expander comes with two DB25 connectors and allows connection of up to 16 balanced line-level signals that can be fed from devices such as mixing consoles or external microphone pre-amps. The IEX16L-A comes with two 8-channel ADAT inputs that can be activated individually. This allows usage of 16 line level sources or 8 line level sources and 8 ADAT inputs, or 16 ADAT inputs on a single IEX-16L-A expander. 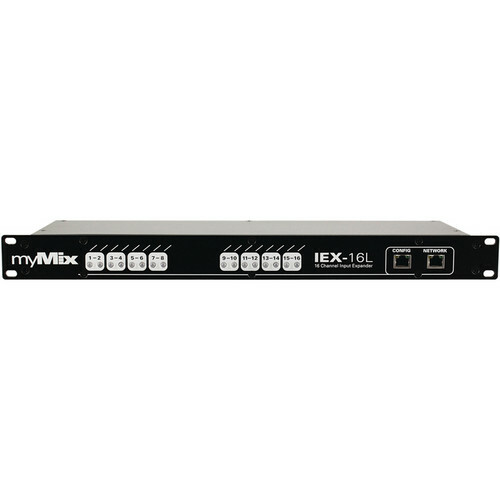 Multiple IEX-16L expanders can be used in a myMix network. The IEX-16L-A can be configured using any myMix device on the network or the optional myMix CONTROL software, including input channel naming and stereo linking. The configuration is stored automatically in the IEX-16L-A. The optional myMix CONTROL software allows uploading/downloading of complete settings for the IEX-16L-A expander. The expander can be locked by connecting a myMix to the CONFIG port, or via the myMix CONTROL. The CONFIG ports provide all the data but no audio. It can also be used to connect the myMix CONTROL network interface (myMIx PLUG). Box Dimensions (LxWxH) 22.0 x 10.0 x 3.0"